In the past Sarah MacDougall will always be remembered as the artist who played an encore song at the Kitchen Garden Café in Birmingham standing on a table amongst a small gathering of people. The evening like so many gigs there was a thoroughly enjoyable one. 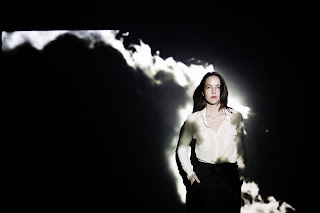 Alas no return visit has meant a little detachment from Sarah’s music, which has now been reversed via a re-introduction through the channels of her new album GRAND CANYON. Where perception of Sarah was of a straight down the middle Canadian folk singer, this new record heralds a highly explorative and experimental artist ready to stretch the boundaries of the genre. The result is an eight track record, though its thirty four minute running time accumulates the standard album feel, which does require a little industry of the listener and a freeing of the mind to unlock the merits of its content. Perhaps it was that lodged memory of Sarah that persisted with the album, an action that paid off while coming across others who dismissed the release. It is a record heavily influenced by landscape, surroundings and subsequent induced feelings. It is also one of identity which features a lot in Sarah’s life as she draws influence from her Swedish heritage and Canadian homeland. From two lands which evoke a colder climatic feeling, you can sense the recording igniting some warmth and this is magnified by the learning that Sarah took herself off to the far north of Canada to undertake the writing task. The inspiring vocals of Sarah tie up neatly with the diverse sounds amply supplied with numerous string arrangements and multiple instrumental raids. Scanning down the list of players revealed a couple of artists demonstrating the close knit status of Canada’s folk community, in total contrast to the vastness of the land. MJ Dandeneau plays as bassist in Sarah’s core three piece band and has played on our shores with at least two touring Canadian acts in Amanda Rheaume and the Good Lovelies. The award winning Rose Cousins is among the guest artists joining Sarah to enhance the record. Going back to identity and two back-to-back tracks on the album tackle the subject. ‘Sparrowhead’ is up among the most enjoyable songs on the album and includes the line ‘take me home my Manitoba’. In contrast, for the following song Sarah returns to her first language in ‘Malmo I Mitte Hjarta’ which even non-Swedish speakers can see the link in its translation as ‘Malmo in my heart’. ‘Baby It’s Only Rock ‘n’ Roll’ has been one of the tracks selected for radio coverage in the UK and this is a sensible choice from the point of view of wider appeal. ‘The Story of Pippi and Lionheart’ had a title which prompted curious investigation which led to a possible link with Swedish child literature and unwraps as a song with a memorable lyrical structure. The same could also apply to ‘2012’ with its consistent use of repetition. The album opens with ‘I Want to See the Light (Lost from Our Eyes)’ a haunting song with a dark sentiment and basically launching a left field sound adrift from your usual folk offering. The title track ‘Grand Canyon’ can be interpreted as a song of personal release and what better metaphor to use than a place of such vast openness. ‘Devil’s Gap’ brings up the rear of the recorded tracks, is a beautifully delivered piece of work and achingly pleads for the ultimate connection in its short lyrical moments. 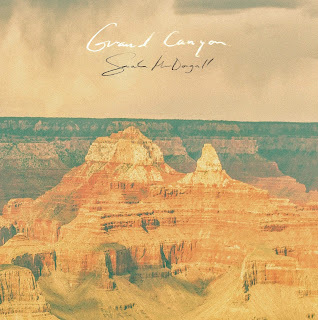 GRAND CANYON is a stimulating and enthralling album, full of gazing and contemplative sentiment. It often wanders into alt-territory with the invitation to follow on its terms. Sauntering down this path will lead you into the enchanting musical world of Sarah MacDougall and its treasure trove of discovery. A table also awaits Sarah for her return to the Kitchen Garden Café one day.